Break up your breakfast routine with a deliciously nutritious Beet and Sweet Potato-Crust with Mushroom, Dill and Goat Cheese Quiche! Do you love a good quiche? I do! 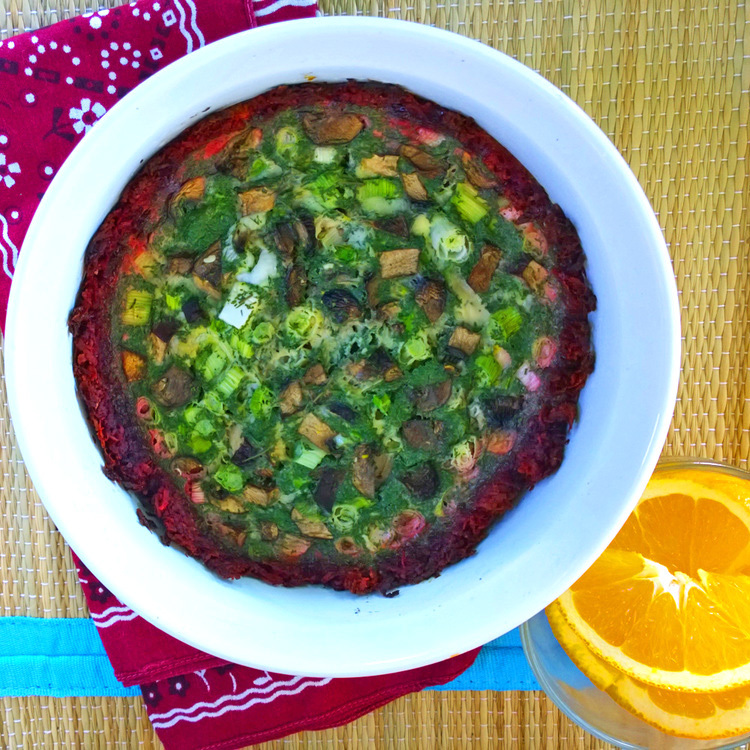 This flour-free flavorful quiche is an absolute delight to create as it has no refined carbs and provides fiber, protein, and vitamins. Beets and sweet potatoes are high in vitamins, such as Vitamin A and C boosting immunity and reducing inflammation. Studies show that beta-carotene (which the body converts and uses as Vitamin A) is important for promoting healthy skin, immune systems, and good eye health and vision. Sweet potatoes and beets also contain healthy carbs providing energy for the body, so it seems natural to use them as a crust, in place of refined flour. 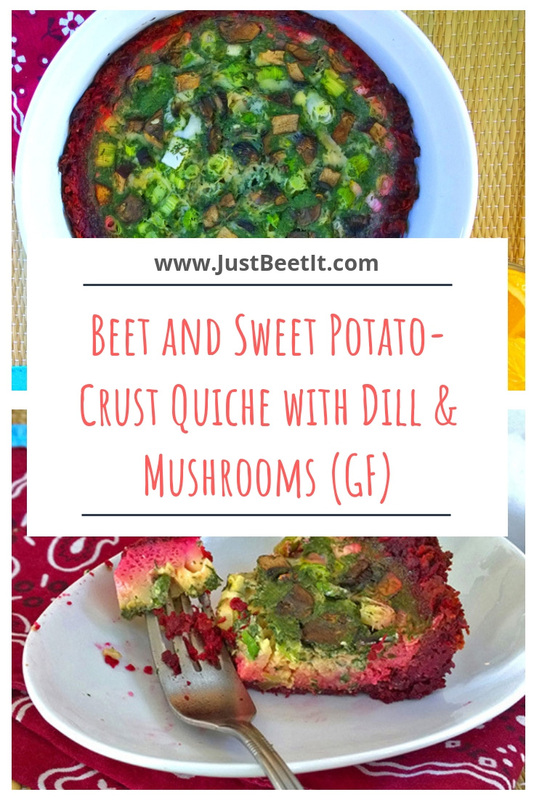 The beet sweet potato crust is not as crispy as a traditional flour crust, but it provides so much flavor and is an excellent flour-less option. I am a sucker for breakfast foods (at all times of the day), and this quiche is a wonderful breakfast/brunch treat. Yum! When my beautiful mom visited me in California a few weeks ago, we had such a joyful mother/daughter bonding time experimenting with delicious recipes in the kitchen. We love cooking together, and this quiche was her idea. Thanks, mom! You're the best! For paleo diets, replace milk with a dash of almond or coconut milk. To eliminate "milk" completely, replace milk with 1-2 tbsp of water (quiche may be less moist and fluffy). For eggs, I encourage using ethical eggs from happy hens. Yup! My hubby and I get our eggs from Vital Farms, a farm that promotes ethical and respectful hen and rooster rearing. The hens live in fresh air and sunshine and forage outdoors year round. Hooray! For a vegan quiche, use egg substitutes. Whole Foods contains some fantastic egg alternatives, such as Follow Your Heart egg replacements. Do you use egg replacements? What are your favorite brands? I look forward to hearing from you. Enjoy! For optional ingredients, add chopped broccoli, tofu, turkey bacon, leeks, shredded carrots, spinach, beet greens, red onions, or sun-dried tomatoes. For herbs, add fresh thyme, rosemary, or basil. 1. Heat oven to 450 F degrees. 2. In colander over bowl, combine shredded beets, sweet potatoes, and 1/4 tsp salt. Let sit for about 10 minutes. Press gently to discard any liquid. Stir in 1 tbsp of the oil. 3. Coat 9" pie plate with cooking spray or oil and pat beet and sweet potato mixture into pan in an even layer, coming up sides of pan to create a thin crust. 4. Bake crust about 20 minutes (until set). If edges get too dark or appear burned, cover crust with foil. 5. Heat remaining oil in skillet over medium-high heat. Add green onions (or leeks) and saute for about 5 minutes. Stir in dill and scatter dill and green onions over crust. 6. Whisk eggs, milk, mustard, remaining salt, and pepper. Pour over green onions and top with goat cheese. 7. Bake until egg mixture is set, 25-30 minutes. Let cool about 15 minutes. Garnish with remaining dill. Slice into wedges and serve.